This is a very nice multiple fish fossil. It is a plate of Diplomystus poweri and Teleosti fish from the Cretaceous Cenomanian Layers of Lebanon. Due to political unrest, fossil from this area are getting harder to obtain. This plate not only has three fossil fish preserved, all three fish are extremely nice The larger fish are Diplomystus poweri. These fish are complete and have very nice detail preserved. On the upper right of the plate is a wonderful Teleosti. This uncommon fish is also complete and well articulated. 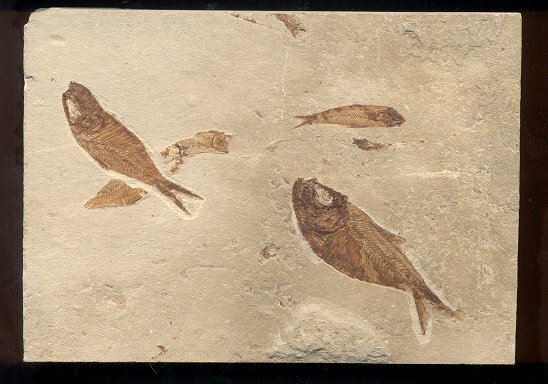 All three fish are well preserved and are beautifully showcased on the unbroken, rectangular plate of sublithographic limestone. This is a very unique multiple plate of fossil fish from the ''Age of the Dinosaurs''.